I snuck out for a few minutes today to check out the new Nations Fresh Foods store in Jackson Square. My camera battery was dying so I only got to take a few photos, but I definitely like what I saw. From this side, you walk into the expansive deli and prepared food section, with at least half a dozen separate counters serving everything from freshly prepared sandwiches to sushi to ready-to-barbecue corn cobs. The store is not square or rectangular like most grocery stores, and there is a distinct down-the-rabbit-hole sense as you continue passing farther into the store diagonally. Past all that, you come to the produce section, which is large, well-appointed and very fresh looking. It carries a wide variety of fresh goods from around the world, but I didn't see a lot of local produce. In particular, the store carried American strawberries but not local. Luckily, the Farmers' Market is nearby and remains the most reliable place in the city to buy local berries. I was a bit surprised that there does not appear to be an entrance from directly outside. The closest thing is the entrance from the underground parking garage. Elevator technicians, freshly back from a recent strike, were on the job as I passed and the elevators should be up and running soon. All in all, the new Nations Fresh looks very, well, fresh: clean, modern, spacious and stylish. It also successfully avoids looking cheap or cut-rate, though at a quick glance, the prices I saw seemed on par with other grocery stores. This will be a most welcome addition to the downtown. 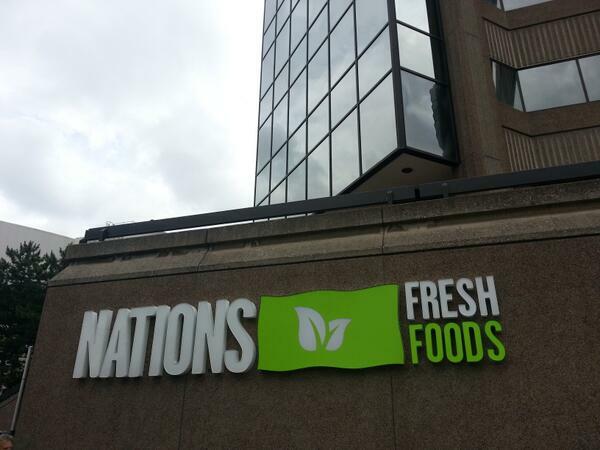 Major props to Nations Fresh for seeing downtown Hamilton as a good risk and investing here, and to Yale Properties for securing a high-quality anchor tenant and working hard to make the opening a success. Update: this article originally made reference to a Shopper's Drug Mart in Jackson Square, but it is actually a Rexall Pharma Plus. Thanks to RTH reader phyx for pointing out the error. You can jump to the changed paragraph. Glad to hear you liked it. Look forward to checking it out and it will be a godsend for quick grocery shopping on those days that the Farmer's Market is closed. There's no Shopper's Drug Mart in Jackson Square. Do you mean Rexall? You're quite right - thank you. I've corrected the error. I like the store, and I like the fact that there's finally a proper grocery within walking distance of where I live, but I do find it dark. I had the constant feeling of being in a basement with something heavy over my head. I wish they'd left it light-coloured as it was when the Farmer's Market was there temporarily. I will be doing the bulk of my grocery shopping there, other than what I do at the Farmer's Market. I am SO RELIEVED this place is there. I live east of Wellington so in order to shop here on a regular basis, I'm going to have to plan a little better. A small price to pay because I love this store! It looks much quieter than when I went on Wednesday. I think I might go again today, it was frustrating trying to have a look the other day, it was like everyone forgot how to walk. Is that a cart I see in the produce picture? I was thinking that getting a decent amount of groceries would be difficult with the wheeled baskets and I had to help the woman in front of me at cash as she had a bad back and could not bend to get her groceries out. When I went on Thursday afternoon around 4 the place was packed right in. I was constantly getting in people's way. Absolutely love this place. Only 2 drawbacks I can see: no organic section, and they don't take VISA. otherwise, great addition to the core and to this horrendous mall. A great addition to the DT. I hope it prospers. Does the store have adequate signage on the outside of jackson square? And the selection of "ethnic" foods reaches beyond Asia: I've been trekking out to Stoney Creek to find a particular brand of an Eastern European roasted red pepper spread, and they carry it at Nations Fresh, along with the monster-sized jars of Marmite that I always ask friends to bring back for me whenever they travel to the UK. German-style chocolate filled croissants. Vietnamese-style instant coffee. 3 litre cans of olive oil. Restaurant-sized jars of curry powder. A whole wall of tofu and soy milks. No health/organic/local food. I suspect that though some market stall-holders will be nervous, that the ones who really are farmers selling local produce won't have much to worry about in the long run. I bought a couple of veggie items at the store the other day just as an excuse to buy something in there so I could check it out, but I went to the Farmers Market today and bought my usual supply. I think people will buy the produce at NF, but I don't think it'll be their regular go-to for fresh foods. It's nice to have the convenience though - especially on non-market days or when you only need one tomato. What a great addition to the mall and to downtown. I live nowhere near it, but this I'll have to check out! We went in there yesterday shortly after opening, and we were very impressed by the array of world products that one would be hard-pressed to find in any given ethnic store. As well, prices seemed quite competitive, and their food court looks like it will offer some good dining experiences. It is most definitely a very welcome addition to the downtown, and will be especially appreciated, I suspect, by people who have relocated from the Toronto area. Does anyone know the store hours? I went this week and found it rather overwhelming. Proper height and size carts are $1. It was dark, confusing, busy, and LOUD (very similar to other Asian groceries I've been in). I was tempted by the huge and interesting selection prepared food, but found it hard to know how to carry this along with my (free) pull plastic buggy full of groceries, and didn't even FIND the place to sit down and eat (so thought it didn't exist, and was pissed). When I get to the checkout I find it doesn't take credit, my usual way to pay for groceries as we have a 'points' card. I looked for organics and actually did find a couple - one brand of yogurt (2 containers, sweetened lemon)and a lone box of Earthbound (american)spinach, but that was it. No recycled-content toliet paper. I didn't know there was more than one checkout, so ended up at the wrong end of the store with a large heavy bag of groceries and and a clam shell of take out hot food that I had to lug all the way around the mall corridor to get back to where I'd parked my bike on Bay (no bike racks there!). Not a happy experience. On the plus side, the selection of packaged food from around the world is impressive (if confusing). It will take some time to check it all out. I can see that it will be convenient when the market is closed, but given the lack of local or organic I don't think I'll be shopping there much, and probably not at all once the Mustard Seed is open. I don't think any culture outside Hamilton would be so obsessed with critiquing a simple grocery store, let alone look at all Asian groceries as dark, confusing busy and loud. Surely all local grocery stores are not bright, sterile, not confusing or busy and silent? If anything, most local groceries are they full of junk food, genetically altered produce and packaged or canned foods which are neatly arranged in bright lit and spacious aisles with large shopping carts to fill and move around comfortably. I think what is happening here is that all Chinese, Korean, Japanese, Indian, even Arab or African groceries are being clubbed together into the broad term Asian by a local consumer. While Nation Fresh Foods is trying to homogenize all the different cultures to make it palatable to an order obsessed society. This store proves that racism is alive and well among ALL races. There's a notice outside that they're looking for workers, but when you go in, if you're not Asian, they (LITERALLY) look you up and down, then laugh at you for even trying to apply. Customer Service - what a joke - speaks no English, and they also hired a bunch of people a few months ago but never called them in when the elevator strike delayed their opening. In the end, they hired mostly kids - and ONLY Asians. If any business hired only whites, they would get into trouble for it, but this place? Racist as hell. Which as far as I'm concerned is where they can go. (And before you accuse ME of racism, I used to live in Asia and have no problems with Asian people - but this store excludes ALL other races.) I sincerely hope they fail. Absolutely impressed with this store. If you're familiar with the other Asian grocery stores in Hamilton, you'd know how much of an upgrade Nations is. Other Asian grocers are filthy and the workers have the worst customer service skills. Nations on the other hand has competitively low prices, HUGE selection of international foods (including freshly prepared foods), and stylish decor. The only drawback is the inconvenient walk to the underground parking garage which is only free for 2 hours if you spend $20+. Overall though, Nations is a great addition to the downtown core and I look forward to seeing the rest of the area redeveloping. Anon, Guess the point of my earlier post was missed by you completely. Stop labeling stores Asian i.e. get you geography right. There are many cultures in Asia who all have grocery stores. It is like calling all pot-smoking, beer guzzling, highly opinionated Canadians red-necks, because you had one bad experience with a red-neck. There are red-necks in all cultures. If you must waste time on critiquing a silly grocery store, at least get it right. God knows this city has the worst reputation in Canada for labelling people and everything that is not local. Not one silly complaint about personal likes or dislikes. Not one vulgar cultural reference. And no silly digressions about the store's design, lighting or shopping carts etc. Just a civilized focus on the items being sold and the earnest celebration of shop owners for their efforts. As a Canadian who lived in Europe for many years, and having recently returned to my home in downtown Hamilton, I find the lack of respectful and intelligent reviews of food/culinary experience/grocery stores here more appalling than the perceived lack of some design features in this store. Good reviews of foods/grocery stores transcend narrow cultural beliefs and old prejudices and brings isolated cultures together. I have yet to see a decent local review of this grocery store that talks about the range of items, the quality of produce it carries or even the views of the store owner and what they are trying to accomplish. I don't think any culture outside Hamilton would be so obsessed with a simple grocery store critique. highwater, No need to be so catty about my remarks. It is clear you are not interested in others expressing progressive views here. Very sorry that I bothered to even comment here. Peace. As someone to recently moved to Hamilton from Mississauga, a city that has many of these Asian stores, this is a big step in the right direction for downtown Hamilton, sure you may not want to admit it's an Asian store, but it in fact is. Simply because they have food available from other cultures doesn't make it any less so, they are just trying to stay competitive and provide a little something for everyone, and good on them for doing so! Do they have any southern style foods like grits or fatback or collard greens? I've always wanted to try cooking southern style foods. When I passed the store I judged it as a pricey supermarket and didn't bother going in. Maybe I should of now that I read these reviews and saw the photo's. I was living in Barrie for the past 2.5 years and in that time Hamilton has changed a lot. I'm finding new places to explore. I was at Nations Fresh Food's today and what a nightmare. I WILL NEVER EVER GO BACK THERE AGAIN!!! It was over crowded the people were rude it is poorly organized and smells like urine. It's supposed to be a multicultural store yet you can only get American cheeses there yet they don't carry bacon. It was not a pleasant shopping experience at all. But to be fair if I was to make something like Chinese food or such and I couldn't get what I needed from my regular stores then I'll probably go there to get the items I need but nothing more. They don't even have garlic powder. I had to goto Fortinos to get the rest. I could of got everything there for about $12 less. Have been to Nations a few times now and will return this morning. Far more interesting than your average grocery store - reminds me of shopping at Kensington Market in Toronto many years ago - though cleaner and protected from the weather. Love the selection of seafood - fresh and frozen - which is priced very well. Keep 2 cloth bags with me these days so that I can pop in on my way home from work and pick up a few things at a time. No more bi-weekly mass purchases taxied home and desperate attempts to use the fresh goods while they're still fresh. This allows me to buy what I need (or have a particular urge for)when I need (or want)it. Very convenient for those of us who utilize public transit and transfer at the downtown core. Recently I was starting to dread grocery shopping. Well, not anymore! I went to this store and it is amazing. So much to choose from. So much variety. This Will be the store that I shop at from now on. cromwellsworld- seriously? Urine? NO. My significant other and I walked up and down all the aisles, and never smelled an unpleasant odour. Even the fish room smelled as expected, was clean, but urine? No. Their sushi is great, I bought a large bento with sashimi, crunchy roll, and sushi plus a smaller box of salmon sushi. On par for quality with Sushi on the run by the food court, Sakura ichiban express in other malls and even Sapporo and august 8. Will be going back for sure. I stopped into this store yesterday for the first time. What a pleasant surprise. I thought it was bright and well stocked. This store offers a huge variety of items. We will definitely go back. I've shopped at Nations several times. 1. Some employees have unsanitary habits - wiping their noses on the back of their hands then touching food. I've viewed this in the produce and fish sections. 2. Earlier this week, an employee placed 2 raw chicken bundles on the same shelf and right beside some baked goods (mini macaroons).The employee was sorting the packaged meat section on the other side of these shelves. 3. Not enough english-speaking employees. All I got was blank looks when I asked where I could find the ginger. 4. Shopping baskets are filthy. 5. Not impressed with the employees I saw eating in the aisles and loudly chatting with working employees. Do they not have a break room? 1. Great selection of packaged food. 2. Prices are competitive if not a little lower. 3. Like that they pre-package the fruit and vegetables. I'm happy with this store, its so convenient to shop here. what makes me more happy is that the B & T in Queen St. and the other store in park St. is soon to be closed,and they deserve it because they have the worst employees who dont have good manners especially in the met department. me and lots of my friends had a bad experience here, when i bought some meet i i ask him to pick the one that look a little bit fresh he got mad and talk in his own language and shouted at me and when he put the met in a plastic he threw it on top and the meet fell on the floor. I'm telling you this sothat the management of Nations fresh food will be aware not to hire those eloyees who came fromthat tore in case tey apply for a job in Nations. so far most of your employees in your meet department are good especially those who are not chinese. please try to hire n employees who can speak and understand english. sorry for my typographical error. what i mean is Meat department.